For in the end I have relocated to write and in fact, this will be completed if the machine becomes me to hang. Let that maybe it pilláis in the process so excuse me in advance. Anyway, I wanted to talk about something that many have spoken before and so I doubt me tell you something you do not know already. I’ll talk Schrödinger’s cat. First of all let’s start with Schrödinger. 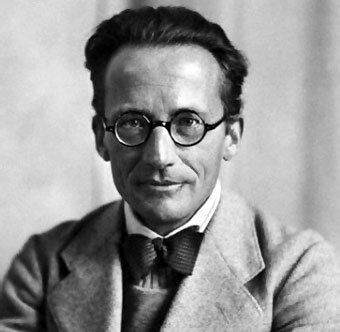 Erwin Schrödinger was greater than the physical quantum physics contributed by the Schrödinger equation which explains how it evolves a wave function of a particle in time. And it is “wise” before our friend or intuited that at very small distances the particles behaved as a wave but no one had been able to think about their behavior over time. Schrödinger is comparable to Einstein in quantum physics and its equation is similar (in scope of time). Without going into too much to the plate, Schrödinger insert Planck so that it is able to calculate as varies the wave equation in time allowing calculate, for example, an electron which can be “statistically” in time orbiting an atom, something that was previously impossible to know. Including achievement relate your equation depending on the speed of the particle is very fast (relativistic they say) or not. Quite an achievement. Schrödinger too and as I explained the other day, I try to show people the like quantum physics was not something separate or different to classical physical world. To prove that quantum physics through his equations was nothing more than a singularity of classical physics devised his famous experiment Schrödinger’s cat. The experiment, as you know, a cat is enclosed in a box with a radioactive particle, a radioactive atom. With them is a Geiger counter that, as you know is capable of measuring a boat radiactividady cyanide. The particle in question has a 50% chance of emitting radioactivity. If the meter detects radioactivity releases cyanide and cat… dies. It’s simple. And this is where all the grace of the matter is. The phenomenon of disintegration depends on the wave of the radioactive particle, then we know the equation of the wave function of the particle and the Schrödinger equation we know that equation over time. At first it was thought that quantum phenomena influenced classical physics, were like separate worlds. But this experiment if the particle undergoes disintegration (a quantum phenomenon) affect the cat (not quantum) relating both types of physics. That is the first and most important conclusion. The second conclusion is that we all know. Quantum wave function is superimposed in two states (and therefore in two states for the cat) which explains how a particle, at these levels, it may be in more than one state at a time, so while in classical physics would only have a state (alive or dead cat, “whole” or disintegrated particle) in quantum physics this in both states at once without any problem. And here it could go on with the Heisenberg uncertainty principle, which leads to the third conclusion, the funniest. The cat and the particle, while in the box, are in both states, perfect, both quantum states, but really, for an observer can only be in one state because if you open the box or the cat is alive or dead ( unless it is a zombie). What does this mean?. Honestly, the wave function of a particle does not tell us exactly where this or that speed is much less as it develops over time, despite the Schrödinger equations. What are the odds indicates that there this but we can never know exactly where the mere fact that the observer influences the wave equation changing it every time you try to measure it (cool huh?). This indicates that the observer is, when does the measurement, which “condenses” (tuned to that word) the wave equation giving a measurement and some data (but then changed) as they spend probability to something concrete. Well, back to the cat, when in the box in both possibilities and we opened the box condense their quantum states, its wave function on something particular. And because the chances of disintegration are those that are not mean that a moment before or a moment later the cat was in the same state (alive or dead, if I live too) if we had not done our observation, our “condensation”. With what the observer is what makes reality. What does this mean?. Well, honestly that there may be many realities depending on who measured. The observer or observers of what happens in our lives are / are the ones that condense in a timeline, in a specific time line, there may be other timelines for the wave function and therefore to different realities. And this to next ?. A basis of the theory of the multiverse in which they are merely different time lines of the quantum wave function of what surrounds us. The collapse and condensation of observation leads to a concrete reality that can be (or not) the same as that could have happened to someone else. Something that leads to a very complicated issue condensation waves by different observers and these physical quantities, a mathematical topic very interesting and much more philosophically that I leave for what you think. All this gives a (if complicated) very complicated mathematics that now are developing and I, particularly, it costs me a lot to understand with all the tequila from the world over.